I will be talking tomorrow (5pm, Tuesday 9 October) at the School of Architecture at University of Limerick (SAUL). Architects Jim Corbett and Maria Donoghue will be hosting the event, an open discussion between Softday (Sean Taylor and Mikael Fernstrom) and myself. The three of us are practising sound artists, based in Limerick. We are open to topics that interest those in attendance, but will certainly be incorporating such topics as acoustics and psychoacoustics; ideas of being and place; the role of close listening in apprehending our built environment; plus particular methods, processes, and concepts from our own practise. As a child I was asked what I wanted to be when I grew up. I couldn't decide whether I would be either an architect or a race car driver. Ever since, I have had a special interest in our place in our milieu, considering each environment in terms of sound energy expressed into an existing topology. The installation I created for the international exhibit "EV+A 2010: Matters" (details) was a practical example of how a working method could derive from this conception. I walked into a room, listened for several days, and created a piece out of only the sounds in that room. In fact, only one particular sound found in the room, as the title "The Lights in Room 7" indicates. My research and practise continues to have great affinity with architectural thought. In fact, some years ago I lectured at Carleton University in Ottawa to Masters Architecture students. More recently I have been composing without formal limits on pitch, rhythm, and timbre -- music free of the staff. Instead, I work with material derived directly from my environment. These sounds may be biotic or abiotic, natural or artificial, without concern for such dialectics. My goal is to emphasise our embedded situation in a network of connections and flows. And to encourage a "free listening" that will lead to "free thinking" that is radical in nature (remembering that "radical" means "from the root"). 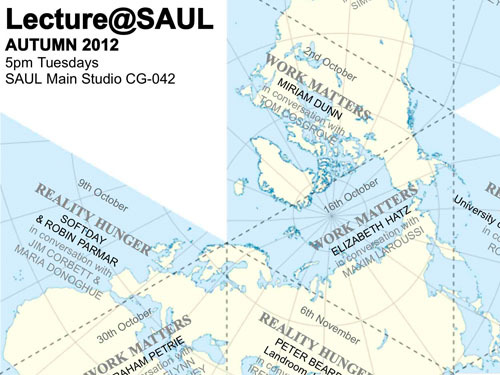 The event is in the SAUL main studio (CG-042). Here is a Google map.